Dimensions 0.25 by 8.25 by 11.25 in. NOTE: This client booklet is to be used in conjunction with the MSCI (Adult) Facilitators Guide and is not useful for any other purpose. Career development in the 21st century presents many challenges and opportunities. Throughout your life you will make countless decisions and experience numerous transitions. Each decision may be subject to a range of influences, for example people we know may give us an opinion, we may be attracted to a particular place or a particular salary, or we may simply want a change. No two people will have the same pattern of influences. 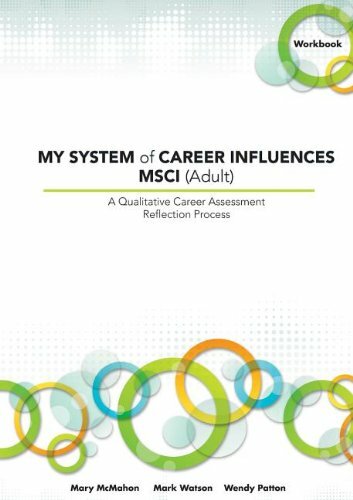 The My System of Career Influences MSCI (Adult) is a qualitative career assessment reflection process based on recent developments in theory and practice. It uses a constructivist view and encourages a narrative and story-based approach to your career development. It has been used successfully with employees by career development practitioners working in a range of businesses and organisations from large to small and in one-on-one career counselling sessions as well as in a group setting.